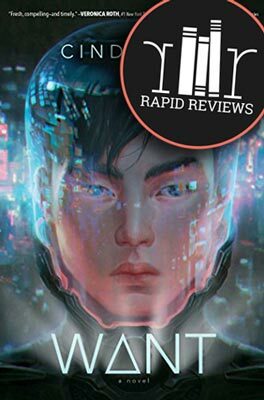 No spoilers in this rapid review of Want by Cindy Pon. I give it 4.25 stars. I really enjoyed it! How does this book only have 900 ratings on Goodreads?! The only reason I discovered it was because two trusted bloggers praised it in their reviews on Goodreads. Otherwise, I’m afraid I would’ve never heard of it. I was still a little skeptical going in because it isn’t widely known. I tend to gravitate toward books generating a lot of buzz because I get all excited about the blurbs and reviews I read. (Marketing works, people!) 😉 But Want was the most pleasant surprise! If you loved Warcross like I did, then I suggest reading this book immediately! Want tells the story of Zhou, an orphaned boy in an alternate Taipei in the not-too-distant future. The city is so polluted that citizens have to wear full body suits and helmets when they’re outdoors. If not, they likely won’t live past forty. The kicker is only the upper class can afford these suits because the price set by Jin Corp, the company that manufactures them, is so high. Together with his team of misfit friends, each of whom has a different skill set, Zhou attempts to infiltrate Jin Corp. But complications with their scheme abound, especially when Zhou begins to have feelings for the daughter of Jin Corp’s CEO. Want truly was a fun ride from start to finish! The pacing was perfect, the characters were engaging and had distinct personalities, and the world building was spot-on. I could easily visualize each scene: on the mountain as the book opens, in and around the polluted city, in Zhou’s posh apartment building while he’s undercover, and at the Jin mansion. Additionally, I love how Pon opened the book with a kidnapping scene that grabbed my attention immediately. It was a smart move to pull readers in like this before backtracking a bit to launch into contextual information and get the story started. (1) Want contains cool new technology which was central to the story’s theme. I’d love to see items from both Want and Warcross in the real world sometime soon! (2) Pon’s writing style reminds me of Marie Lu’s. Her prose is direct and crisp, with just the right amount of description. It set the perfect tone for this type of “techy” book. I’m sure you’re not surprised that I definitely recommend this book! It was full of suspense, good friendships, and fun storytelling. While Want didn’t exactly end in a cliffhanger, I’m disappointed to see that book two, Ruse, isn’t due out until 2019. I was hoping for a release next year!!! Let us know what you think about Want in the comments! No spoilers on this page, please! Ready to read Want? Click to buy and help us pay for hosting. Oh and share this rapid review of Want with your friends who might like this book!